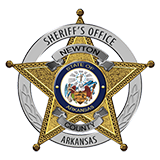 Newton County Sheriff Keith Slape said that the Newton County Sheirff's Office and the Arkansas State Police is investigating the death of Donald K. Davis, 45, of Pelsor. Slape said that the Newton County Sheriff's office received a call Friday September 24th, around 1:30 pm of a non-responsive male. First responders and paramedics arrived on scene and found Davis with an apparent self inflicted gun shot wound. " The investigation will continue and until confirmation from the medical examiner" Slape said.